In May of 2009, my best friend and I spent two weeks in Italy. During this trip we met a host of lovely strangers that made our trip memorable. Two of these strangers were Josh and Lauren. Z and I try to have the local experience as much as possible so when in Rome we asked a Roman to dinner on couch surfing. This Roman, Francesco, brought along three other travelers- Josh, Lauran and Sam. That night was like a night out with good friends, we discussed travel, our backgrounds, and the places we would like to visit in our lifetime. Oh and there was a lot of discussion on Lauren’s infected leg. She ended up going to the ER that night. Lauren and Josh have been telling us to visit Halifax, Nova Scotia (their home) ever since. The four of us have managed to stay in touch through Facebook and travel has continued to be a hot topic amongst us. This April, Josh finally called us out on never visiting but having the time to visit so many other places. Fair point. With no real reason not to, Z and I looked at our calendars and finally confirmed a trip to Nova Scotia to meet two people we met for one night four years ago. We decided to go on a road trip from Maine because the flights to Halifax were too expensive. We met in New York and arrived in Portland together. We landed on a Wednesday night and checked in to a hotel near the airport. After getting our car the next morning, we headed out for a quick tour of Portland. 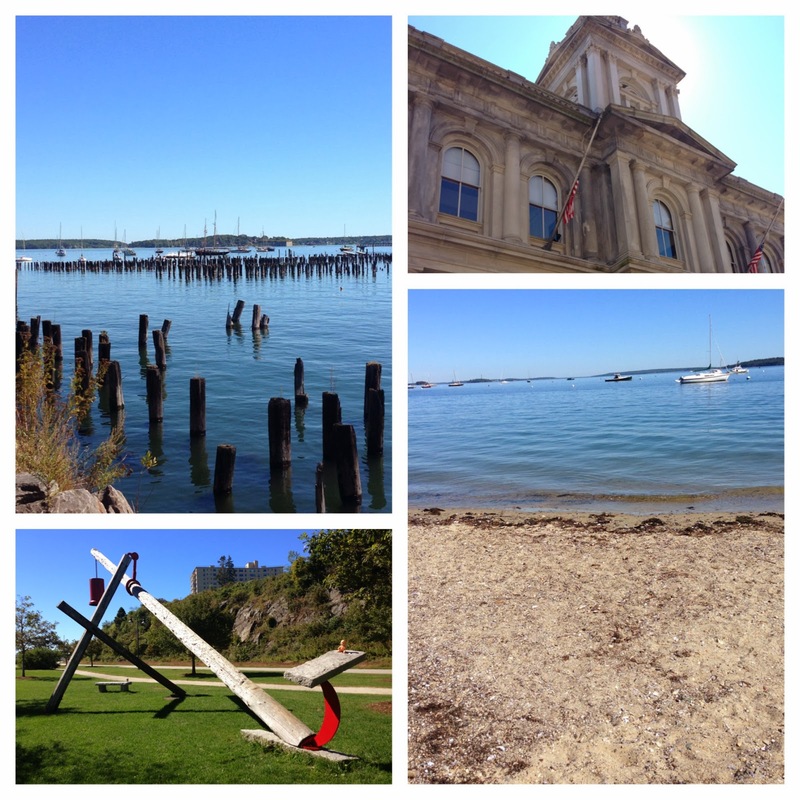 It started with breakfast at Hot Suppa and then walks along downtown, Fort Allen Park and East End beach. We ended our time in Portland with some delicious gelato from Gorgeous Gelato. I was amazed at how small and industrial the city was! I don’t know why but I expected it to be a bit larger. We wanted to spend the weekend in Halifax so we kept ourselves on a schedule otherwise we would have loved to explore the small towns around Portland and of course all the lighthouses! 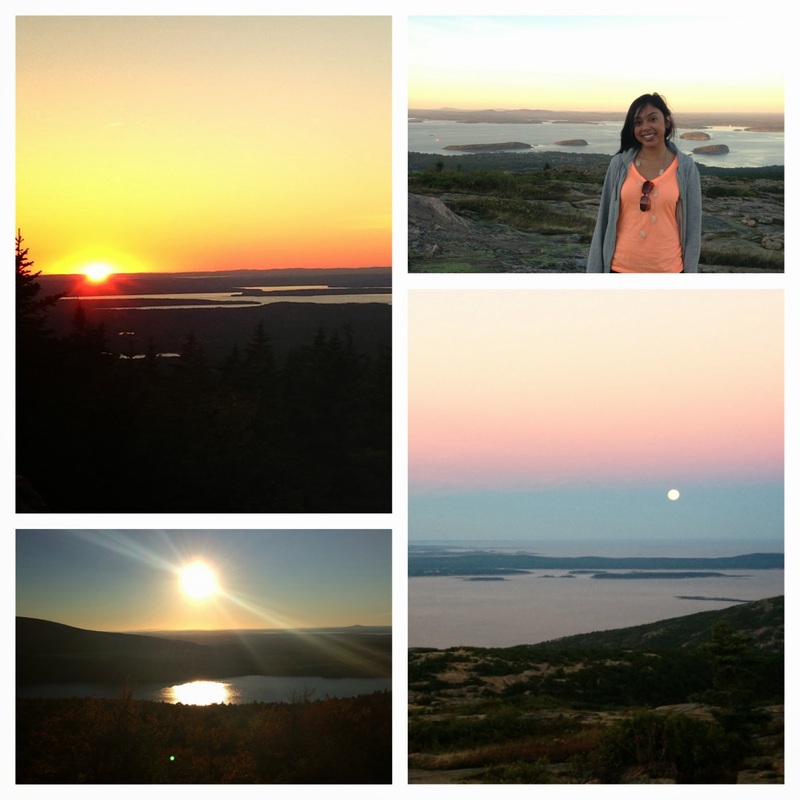 We drove straight to Acadia National Park and were lucky enough to catch a beautiful sunset and an orange moon. The sight was breathtakingly beautiful! In the beginning we were running back and forth to take photos of the mesmerizing sights but when we realized how crazy we looked, we finally stopped and took in the rare moon sighting. We were happy and hungry and decided to head into Bar Harbor for dinner. Bar Harbor is a town right outside of the park and is usually filled with tourists. We found a place with great atmosphere and of course ordered way too much food. We had 2 lobsters, lobster mac n cheese and mussels. Everything was so good! We arrived at our bed and breakfast fat and happy. We had a light breakfast and headed out towards the border. Six more hours to Halifax. Since I was the sole driver, yup he doesn’t have a license, I wanted to break the drive somewhere near the three hour mark. This happened to be near Saint John in New Brunswick. We stopped in the quiet fishing village and had some..you guessed it..lobster. 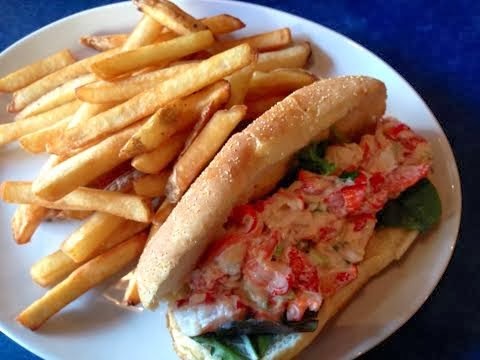 But this time it was in the form of lobster rolls. Equally delicious of course. Recharged and excited to be almost there we headed towards our destination. We passed a lot of beautiful windmills and saw signs of fall around us. Amazingly, there was absolutely no traffic. Driving this distance might sound like a terrible idea but it was actually really calming. Since our phones did not work in Canada, we arrived in Halifax a little lost. We had to run into a Tim Horton’s for their wifi so we could get back on track. We arrived shortly thereafter to Josh’s around 5pm! He had planned a jam packed weekend of activities for us so we quickly freshened up before heading out to dinner. Halifax is a very young town, lots of colleges and lots of college kids. I felt like I was back in Birmingham again. Dinner was followed by a house party and then some dancing and last but not least, POUTINE. We enjoyed everything about this night but the extensive selection of Poutine at Smoke’s left us wanting to try their many many variations. The next morning the four of us drove to Peggy’s cove, a beautiful little fishing town. The only reason I was ok skipping the lighthouses in Maine was because I knew I would see Peggy. Even though the lighthouse is the highlight, the town is equally memorable. We headed to the town of Lunenburg next. Josh’s parents still live there and were kind enough to host us. When we arrived, his dad was coming back from grocery shopping and had gotten supplies to make us a home cooked meal. The kindness of strangers continues to leave me speechless. Josh is very proud to be from Lunenburg and rightfully so. Old town Lunenburg is a UNESCO World Heritage site. He gave us the grand tour which included the major sights and of course places important to Josh. It was so great to hear stories from his childhood and running into people he has known all his life. After seeing the town center, we decided to drive along the coast for the views. Every single turn was beautiful. Nature is the true sight here. While driving, we spotted the little town of Blue Rocks and were amazed at its sight. We stopped the car and got out to take some photos. Once we were done exploring, we decided to head back home for dinner. And then the real adventure began. On our drive back, we were passing through the street where he grew up and the sun was setting so naturally we decided to park the car to take in the view of the harbor. As I parked, I didn’t realize there was a ditch on the side of the road because it was covered by grass. So our car got stuck. We all got out and tried to push it out without much success. Luckily, this street was also where his aunt, Nancy, lived. We went to pay her a visit and she of course was also really kind. She offered us drinks and her beautiful house while we figured out what to do. The tow company told us 40 mins and that turned into 3 hours and then some. We invited Nancy to dinner with us and decided to head back home with her. The meal was just what we needed. Steak, shrimp, salad, bread, beans and corn. Mr. Powers definitely went above and beyond to make us feel right at home. We headed back to Nancy’s house after dinner to wait for the tow truck. Luckily, it arrived within 30 minutes and got our little car out successfully and only cost us $20! To celebrate, we headed to a barn party on the harbor. There was a local band and some swing dancing. The vibe was so refreshing and intimate. It was such a great experience and I’m happy we got to see the locals in their natural element. We closed out the night by visiting Josh's old elementary school, Lunenburg Academy, and its cemetery to visit some ghosts. The next morning, Mr. Powers made us some breakfast. He really is amazing. We packed up and said our goodbyes to him and headed to Mahone Bay, Lauren’s hometown. Mahone Bay is even smaller than Lunenburg. We walked through a local street market and took a coffee break before getting back in the car and heading to Halifax. Our flight home was on Monday morning from Portland and I wanted to be at the border by Sunday evening. Once in Halifax, we said our goodbyes, got some poutine for the road and started our drive. While researching for the trip, I came across pictures of Hopewell Rocks and knew that I wanted to see the teapots. We decided to make this our break point. We arrived at 5:05pm and the doors closed at you guessed it, 5:00pm. I was heartbroken. But there were still cars in the parking lot so Z and I crossed over the gate and walked in, not sure if we were breaking any laws but we wanted to at least attempt to see the teapots. We saw a handful of people and felt reassured. We weren’t sure if it was high tide or low tide and if we would even see anything. You should have seen my face at the end of the hike. I was so excited to see the teapots and could not stop smiling! I was so happy we made it and so happy we tried. We spent a half hour exploring and taking pictures before heading back. We made it back to the United States by the evening and slept in a tiny motel near the border. We headed to Portland in the morning and stopped at the famous Bintliff’s for breakfast. My plate of homemade corned beef hash was the perfect way to end the trip. It was such an indulgence and every bite made me appreciate the experience. Z got waffles and eggs and was also happy with his selection. Z and I are used to taking one international trip a year and that has become tougher to maintain but this was a great substitute. I am so glad we planned an impromptu trip to meet fellow traveling friends. Makes me miss you guys already! Can't wait to be reunited again soon! - Josh!